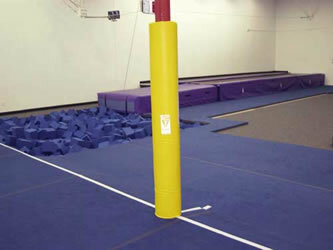 Cushion potential impact zones and enhance your gym's appearance at the same time! These pads are made using 1/2" wafer board to which foam is bonded. Pads are then upholstered with an 18 oz coated vinyl. There is a 1" lip on the top and the bottom for easy mounting. 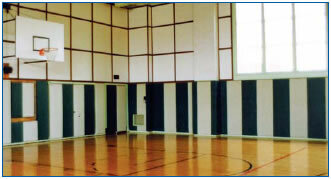 Produced in 2' x 4', 5', 6' or 7' panels. 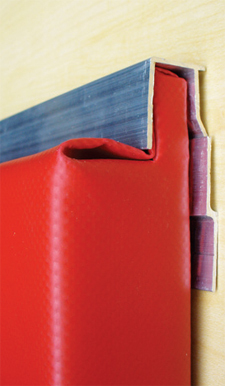 Firm - 1.375" crosslink foam padding. * Rainbow of colors to choose from - Royal blue, light blue, red, green, white, yellow, orange, black, maroon or tan. These can easily be screenprinted with your team's name or logo by your local screenprinter prior to installation. Cutouts for electrical, can be provided at an additional charge with your good drawing. Optional 3-piece Aluminum Channel for mounting - comes in 6' sections. It is $45 per 6' length. See how the channel mounting works: here. Request a Quote with shipping included!